DABELI is one of the great Mumbai street foods. Dabeli literally means pressed in Gujarati.this is originating from Katch region of Gujrat.Now its very famous in all over india & not only in Gujrat. It is very tasty & filling snack recipe. 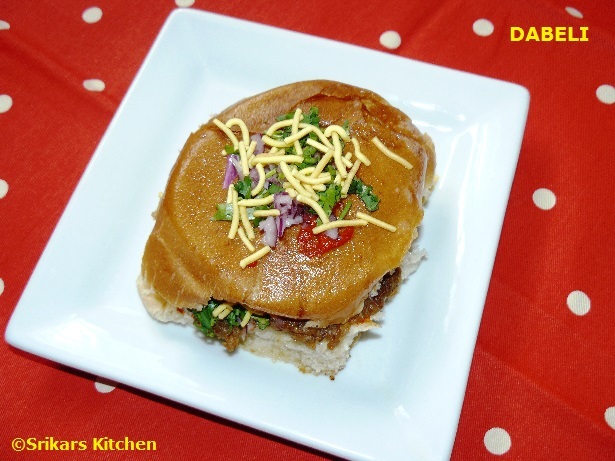 This perfect for evening snack with cutting Chai.The other name of this dabeli are Desi burger or kutchi double roti or kutchi burger. This is another version of Vada pav which is little variations of masala & spices.It is spicy, tangy and sweety taste desi version of burger. Dry roast these ingredients & grind with fine powder & keep it aside. This is Dabeli masala. Grind all ingredients & keep it aside. Mix 3 tbsp tamarind chutney + 1 tbsp dabeli masala + 1/2 cup water & mix well. Add to this mix on kadai & allow to saute. Add boiled potatoes, salt & mix well . Allow to cool & keep it aside. Take a pav & cut into half , apply one side tamarind chutney & another side spicy garlic chutney. Add dabeli potato masala, chopped onion, pomegranate, roasted peanut, sev & cover it with other side . Heat little butter on tawa & roast it both sides & garnish with little both chutneys , onion & sev.